Legacy MAM retrieve service is a replacement of the original Metalogix Archive Manager Exchange Edition (MAM EE) retrieve service. This service is used to access archived files over the legacy shortcuts, if you have uninstalled Metalogix Archive Manager (and Archive Web) from your computer, and you need to check the archive contents. Important! Do not uninstall HSM from the server. It will be needed to access the MAM shortcuts and to retrieve the archived items. 1. 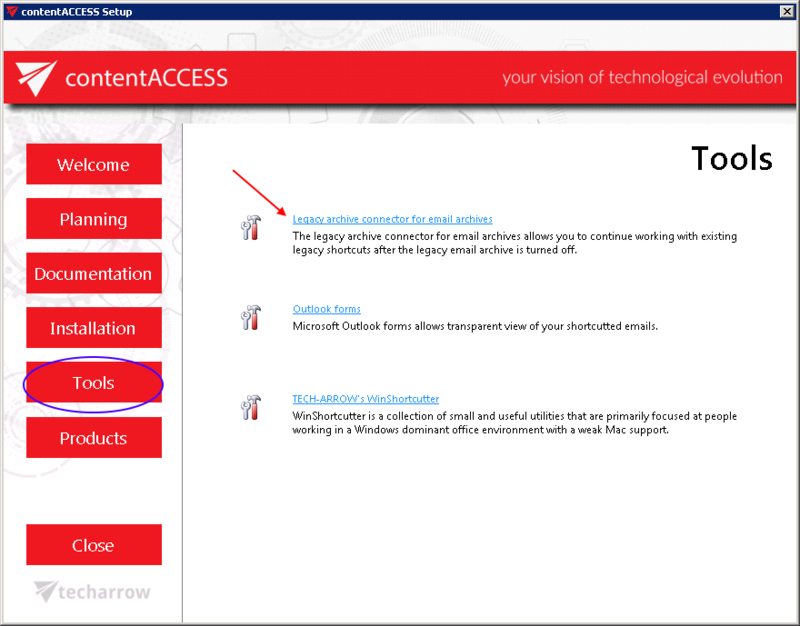 In the Tools of the contentACCESS setup package click on Legacy connector for email archives/Legacy archive connector for MAM EE and run the setup package. By default it unzips to C:\Program Files\TECH-ARROW\contentACCESS\LegacyMAMRetrieve folder. Click “Unzip”. After the files have been successfully unzipped click “OK”. 6. The “Add Application Pool” window will open. Enter “LegacyMAMPool” as name and select the .NET Framework version from the .NET Framework version dropdown list, then click OK.
7. Right click on the newly created “LegacyMAMPool” in the grid, and select “Advanced Settings” from its context menu. 8. Change “Identity” to “Local system” built in account in the “Application Pool identity” window, then click “OK“. a) Right click on the “Default Web Site” and click on the “Add Application“. b) Enter “ExchangePAMWS” into alias and “C:\Program files\TECH-ARROW\contentACCESS\LegacyMAMRetrieve” as Physical path. Select the “LegacyMAMPool” by clicking the “Select” button. a) Select the “ExchangePAMWS” node by clicking on it. b) Click “Basic Settings…” in the Actions pane (right side of the IIS Manager). c) In the “Edit Application” dialog, select the “LegacyMAMPool” by clicking the “Select” button and enter “C:\Program Files\TECH-ARROW\contentACCESS\LegacyMAMRetrieve” into the Physical path textbox. c) Activate legacy archive support with clicking on the “Activate legacy archive support” option in the warning box. d) Database settings: go to Email Archive ⇒ Settings ⇒ Databases button on the ribbon, and configure the connection with the old Metalogix database on the MAM server. In this use case the MAM database is on TAPAM01. 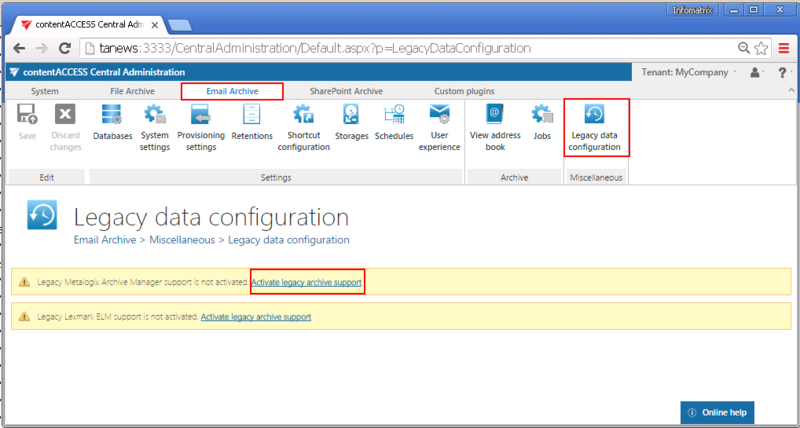 e) Navigate back to the Legacy data configuration page on the ribbon, and select the created database connection from the database dropdown list. Now you can configure the URL’s for the MAM retrieve server. Click “Configure“. In this step, the contentACCESS will configure the retrieve proxy with the correct parameters. Once the retrieve service installation and its configuration is ready, it will be possible to retrieve the old MAM shortcuts from Outlook/OWA and browse the legacy archive through contentWEB.